The 2014 winner of the FishPal Malloch Trophy – for one of the largest salmon caught by an angler on a fly and safely returned during the year in Scottish waters – has been announced. 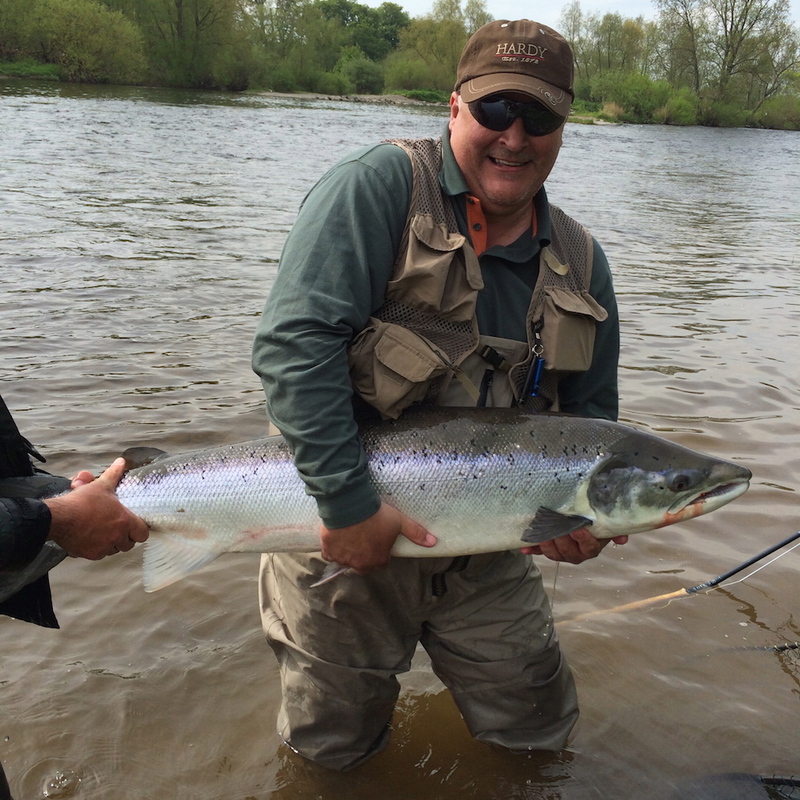 The successful angler is Wayne Longstaff of Teesside for a fine spring salmon caught on the River Tweed. Mr Longstaff, on being told of the decision of the FishPal Malloch Trophy Committee on December 17th, commented: “I have been salmon fishing for ten years now and this was my biggest fish to date by a long way. This ‘fish of a lifetime’ was superbly shaped, in prime condition and sea-liced. It swam off strongly after we had taken a very quick photograph”. Mr Longstaff’s salmon, accurately weighed at 33 lb with a length of 45 inches, was landed on May 5 in the Cottage Stream pool on the Hendersyde beat of the River Tweed, before being carefully released back into the river. To be eligible for the trophy a fish must be caught on a fly in a sportsmanlike manner and be returned to the water. The fish was caught on a Hardy Elite rod with a Hardy 2000 reel, a Mach 55 sink-tip fly line and a Pot-Bellied Pig fly. The fish was weighed in a weigh-net by Hendersyde head boatman John Kitchingham. The accuracy of the weigh-net was subsequently verified by keen angler John Taylor of Wylie Butchers in Kelso using 33 lb of meat! At the FishPal Malloch Trophy Committee meeting on December 17th several possible contenders were considered. Mr Longstaff’s entry, which fulfilled the relevant criteria including best evidence, was endorsed as the winner for 2014. His name will be engraved on the Tay Foundation’s trophy, joining an illustrious list of previous winners which stretches back four decades. He will also receive a replica Malloch Trophy, a £250 FishPal Voucher, a Mackenzie DTX rod and a place on Scott Mackenzie’s Spey Casting Masterclass course. The runner-up is Gordon Smith of Buckie for a heavy salmon caught in October on the Birse beat of the River Dee. John Wood, Chairman of the Tay Foundation and a member of the FishPal Malloch Committee, commented: “I am delighted that this year’s winning entry is for a spring salmon, which for many salmon anglers are the most prized of all fish. Unfortunately runs of spring salmon have over the last few decades seen a disproportionate decline and they need as much protection as possible. The safe release of Mr Longstaff’s magnificent fish illustrates the commitment by the great majority of anglers to conserving spring salmon”. Mark Cockburn, CEO of sponsors FishPal, said: “2014 has been a disappointing season for salmon fishers across the North Atlantic. That said, with salmon angling there is always the possibility that the next cast will produce the fish of a lifetime. Our congratulations go to Wayne Longstaff for fulfilling this dream”. Robert Rattray, Secretary of the FishPal Malloch Trophy, added: “This season was the first since the Committee widened the criteria for deciding the annual winner. It is now not necessarily awarded for the largest fish although this remains an important consideration. Other factors such as the time of year of capture, the condition of the fish and how it is handled – in line with best catch and release practice – are also taken into account”. 1) The Malloch Trophy is named after the Perth manufacturer and retailer of fishing tackle, Mallochs of Perth – recognised as the greatest name in Scottish tackle history and founded by P D Malloch, one of the leading salmon authorities of his day. The Trophy was first awarded in 1972 for a 43 lb fish caught on Tweed by Lady Burnett and awarded in 1999 following a run of 28 consecutive years (when it became the most keenly contested angling award in Scotland) for a 33 lb fish caught on the Spey. 2) After 1999 the trophy was not presented and remained locked in a cupboard for over 10 years; it was lost to the salmon fishing world until the Tay Foundation was able to acquire it. In 2014 the Tay Foundation entered into a three year partnership with FishPal with the aim of continuing to promote voluntary catch and release programmes, and the conservation of large salmon in particular, on all Scottish rivers. 4) The Malloch Trophy Committee, including representatives from across Scotland, met on December 17th 2014 to consider this year’s contenders. The Committee’s decision in all matters is final and no correspondence will be entered into subsequent to the award winner being announced. In December 2013 the Committee decided to widen the criteria for deciding the annual winner with the new criteria taking effect from the 2014 season. It would not necessarily be awarded for the largest fish although this would remain an important consideration. Other factors such as the time of year of capture, the condition of the fish and how it is handled – in line with best catch and release practice – would also be taken into account.